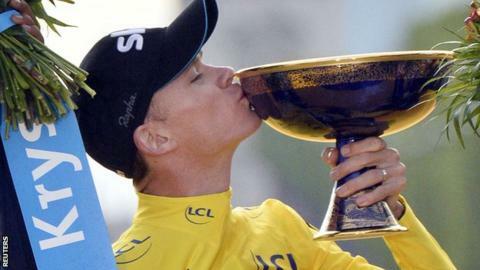 Chris Froome became the first Briton to win the Tour de France twice when he safely reached the finish line in Paris at the end of the three-week race. The 2013 champion finished alongside his team-mates on the final stage, behind a sprint won by Andre Greipel. Mark Cavendish, seeking a fifth win on the Champs-Elysees, finished sixth after the 109.5km race from Sevres. The win for Froome means a Briton, and Team Sky, have now won three of the last four of cycling's showpiece races. Froome, 30, beat Colombia's Nairo Quintana to the yellow jersey by 72 seconds with Spain's Alejandro Valverde third. The final stage ended with 10 laps of a 7km course around Paris but the times for the general classification were taken the first time they crossed the finish line because heavy rain in the French capital had made the roads treacherous. That meant Froome could not lose time if he was held up by a crash or mechanical problem but he still had to complete the stage. Inside the last 10km he had to stop to remove a paper bag that had got caught up in his gears, while moments later he rode over a discarded water bottle. If either had caused him to crash and not cross the finish line his title would have been cruelly taken away. However, he stayed upright and rode over the line arm-in-arm with his Team Sky team-mates several seconds behind the main bunch. How did the other Brits get on? There were a record 10 Britons at this year's Tour, with Geraint Thomas (15th, Team Sky) the highest ranked after Froome. The Welshman rode through the pain barrier, and at one point a telegraph pole, in the name of helping his team-mate Froome and was up in fourth until the latter stages of week three. Froome was also supported by Ian Stannard (128th), on his second Tour, and Luke Rowe (136th) who was making his Tour debut, while Team Sky lost Peter Kennaugh to illness on stage 16. Sprint specialist Mark Cavendish (Etixx-Quickstep, 142nd) had a mixed Tour, having been accused of giving up in a sprint on stage two, something which he reacted angrily to. The Manxman took his record tally of Tour stage wins to 26 by winning on stage seven, but lacked team-mates to succeed on the Champs-Elysees. Twin brothers Adam Yates (50th) and Simon Yates (89th) not only made it to Paris on their Tour debuts, but often put their Orica-GreenEdge team in front of the cameras with regular breakaways. A stage win for Stephen Cummings (86th) for his MTN-Qhubeka team on Mandela Day would have made the man from the Wirral a popular man in his camp. And Movistar's Alex Dowsett, who Bradley Wiggins took the hour record off earlier this year, had to withdraw on stage 12 after a crash earlier in the Tour. Froome had led the general classification since stage seven. In fact, he had never dropped out of the top two positions since the third stage and up until Thursday held a lead of three minutes 10 seconds over the field. In the end it turned out to be the narrowest winning margin since Carlos Sastre beat Cadel Evans by 58 seconds in 2008. But it will be seen as vindication for Froome, whose composed and gritty riding was at risk of being overshadowed by persistent questions over the legitimacy of his performances and three isolated incidents of abuse from spectators. Froome's Tour victory was predominantly established by an excellent first week, followed by a phenomenal burst on the climb to La Pierre-Saint-Martin on stage 10 that put him almost three minutes clear. It was that climb which caused some to question whether Froome's performances were being enhanced by doping, with a French TV channel using images of Lance Armstrong to draw parallels between the shamed drugs cheat and the Team Sky rider. A French physiologist also presented data that he described as "abnormal". But Team Sky produced their own numbers to counter that claim and Froome has repeatedly said that he is clean. That has not stopped Froome being subjected to abuse from spectators, as he claimed he had urine thrown at him on stage 14 and appeared to have twice been spat at in the last two stages before Paris. Team-mate Richie Porte has said he was punched during stage 10. There is also a sense that Kenya-born Froome has never fully secured the support of the British public, particularly in comparison to Sir Bradley Wiggins, who was the first Briton to win the Tour in 2012. It remains to be seen whether his victory this year, which came among a field of Grand Tour winners including Quintana, Vincenzo Nibali, Alberto Contador and Alejandro Valverde, will persuade doubters of his ability. Much was made of the big four of Froome, Nibali, Contador and Quintana all racing against each other. Quintana said he ultimately lost the race on stage two when he finished 88 seconds behind Froome. He gained time in the Alps but had to be content with second, replicating his result behind Froome in 2013. Defending champion Nibali finished alongside Quintana on stage two and lost further time on stages eight and nine before fading further as Froome dominated stage 10. Although the Italian did win stage 19. Contador came into the race hoping to become the first man since 1998 to win the Tour and Giro d'Italia in the same year. He would also have held all three Grand Tour titles, having won last year's Vuelta a Espana. However, the Spaniard never looked at his best in the mountains and had to be content for fifth overall. Polka: The King of the Mountains. Froome became the first rider since the legendary Eddy Merckx in 1970 to win both the overall race and mountain classification in the same year. White: Best young rider. Quintana won it for a second time in three years by finishing second overall. The 25-year-old will be too old to contest it in 2016. Has Chris Froome joined Britain's greatest road cyclists? Team award: For the team whose top-three riders have the lowest cumulative time. Won by Movistar, who beat Sky by 57 minutes 23 seconds.